iOS 9 now makes it easy for users to discover information in apps by surfacing the content of the apps and websites in Search on iOS 9. Deep links make it easy for users to get back to where they were in your app—just indicate that your app is eligible for Search and iOS 9 will create them for you. Help users find relevant information within your app by using Core Spotlight to add it to the iOS 9 Search index. You can now indicate items on your website that can be accessed from your app and make those available to Search. iOS 9 also supports flexible universal links that seamlessly take users back to your website or directly into your app if it’s installed. What is Deep Linking in iOS 9? Deep linking is a way for app developers to communicate what content can be found within their apps and a way to specifically trigger links and actions to specific pages or sections of their app. Apple claims you will see an “increase the usage of your app” and more importantly “improve its discoverability by displaying your content when users search across the system and on the web.” For example, searching for “potatoes” yields recipes from several apps, taking users directly to the recipe page. Apple’s embrace of deep linking will also boost Google and Facebook’s similar initiatives. The changes will allow users to jump from app to app more naturally, as well as blurring the division between local apps and web-based content (& reduce the amount of time you spend entering login credentials). Meanwhile, content within apps can show up within iOS 9’s newly-supercharged search. Method: use NSUserActivity to mark specific ‘activities’ or ‘app states’ as searchable. Functionality: When a searchable activity or app state appears in Search or Safari results, users can tap the result to return to the relevant area in your app. Benefits: NSUserActivity introduces properties you can use to provide indexable metadata about an activity or state, this helps provide rich information in the search results. For example, you can specify a title, description, and thumbnail image for a result. Implementation: To make an app activity or state searchable, create an NSUserActivity object to represent it. Use NSUserActivity properties to fully describe the activity or state and to make it eligible for search. Continuing an activity – When a user taps on a result that’s associated with an activity or state, your app uses NSUserActivity APIs to continue the activity and restore the user’s position. NOTE – An activity that’s marked public can be shown to other users and can help encourage them to use your app. By default, activities are private. You should designate an activity as public only when the activity might be useful for other users. In general, user-created content is never useful for public results. To mark an activity as public, set the eligibleForPublicIndexing property to YES. Method: iOS 9 allows apps to communicate bidirectionally with Spotlight, the iOS system-wide search feature. iOS 9 apps can ask for their content to be shown in the Spotlight search results. Benefits: Core Spotlight provides a database-like API that lets you add, retrieve, update, and delete items that represent searchable app content. When you use Core Spotlight to index items, you make it easy for users to search their own content. Apple indexes web content and makes it available in Search and Safari so you need to add markup to help Apple discover & index your content & display rich results. If you mirror your app content on a website (or your app gets all its content from a website), you can use web markup to give users access to your app content in Search results. Apple allows developers to add advertising banners (called Smart App Banners) to promote your app directly on a website. Adopting Smart App Banners is the best way to help users of your website discover your app. Including an app-argument in your Smart App Banner markup allows Apple to index your content. What are Smart App Banners? 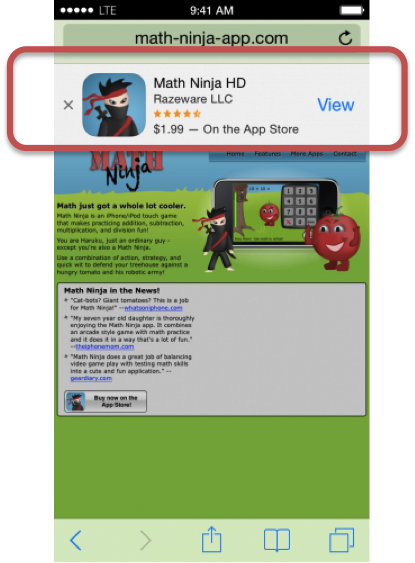 Smart App Banners provide a way of promoting apps when viewed in mobile Safari. Presented as a fairly unobtrusive banner at the top of webpages they show details of the app, it’s icon, ratings and price information. If the app is already installed on the device the ‘view’ button says ‘open’ and clicking on the banner launches the app. If the app isn’t installed clicking the banner launches the app store, taking the user to the app download page. They only show on the Safari browser on iOS devices. If an app isn’t available in the user’s country, the Smart App Banner will not display. Smart App Banners detect whether the user already has the featured app. If not, the Smart App Banner invites the user to download or purchase the app, and tapping View brings the user to your App Store page. Add a meta tag to the head of your website that has an ‘app-argument’ tag. In your app, use the ‘application:openURL:sourceApplication:annotation:’ method. As an alternative to using Smart App Banners to describe deep links on your website, you can use one of the open standards Apple supports. Use standards-based markup for structured data such as Schema.org to annotate your web content so that users can see rich search results. For example, a recipe website might use the markup shown below to provide richer information about a recipe. In addition to using structured data markup from Schema.org, you can provide Open Graph markup for specifying an image, or preferred title and description to accompany the result. Method: In iOS 9, your app can register to open web links (using https or http) directly, bypassing Safari. This connection between your app and website helps Apple surface your app content in search results. Functionality: After you place the signed JSON file on your website and your app adds the entitlement, when a user taps on a link to your website, your app opens to handle the link. Support for these universal links is built on the same mechanism that powers Handoff between a web browser and a native app, and shared web credentials. A trust relationship between the app and the website is established by adding a com.apple.developer.associated-domains entitlement to your app and an apple-app-site-association file to your website. STEP 1 – In your com.apple.developer.associated-domains entitlement, include a list of all the domains your app wants to handle as universal links. STEP 2 – In your apple-app-site-association file, you can specify which paths from your website should be handled as universal links. To receive the link and handle it in within your app, you need to adopt the UIApplicationDelegate methods for Handoff (specifically application:continueUserActivity:restorationHandler:). It avoids the privacy issues. Since use of the custom schemes doesn’t tell the originating app whether or not you have the destination app installed. links always open in the correct app, which isn’t true of URL schemes since any app can technically adopt them, resulting in conflict if more than one select the same. Maintains a solid failure path which doesn’t result in a user encountering nothing at all when an app isn’t installed (the URL will direct them to an app’s companion website in Safari, either to the relevant content, or, so long as a developer sets one up, to a destination page that can prompt an app install). They use standard http or https web links, and let you specify how much of your site can be found in your app, and what to do when content isn’t actually in your app yet (they can still find it on the web, and when you do add it, they’ll automatically be redirected to the app). How to set up Universal Links? There is a hard 50 URL scheme limit on apps submitted prior to iOS 9 that’s generated automatically though usage, after which using them will result in a failure without any indication of what’s gone wrong. NOTE – You do not need a web version counterpart like you currently do with Google’s App Indexing protocol. Deep linking can get results for your app even when a user doesn’t have your app installed. Search landscape now has Google’s app indexing, Bing’s app linking and Facebook’s app links + Apple’s Deep Links. App Search in iOS 9 gives users great new ways to access information inside of your app, even when it isn’t installed. When you adopt iOS 9 Search, users can access activities and content deep within your app through Handoff, Siri Reminders, and Search results. In addition to improving the user experience, adopting Search helps you increase the usage of your app and improve its discoverability by displaying your content when users search across the system and on the web. NOTE – The three Search-related APIs are designed to work in concert. If you mirror app content on the web, you can adopt all three; apps that don’t have related content on the web can adopt NSUserActivity and the Core Spotlight APIs.